engines (boats and lawn mowers), charcoal and wood fires, agricultural burning, and tobacco smoke. CO is classified as an indirect greenhouse gas. It does not contribute to global warming directly, but leads to the formation of ozone. Ozone is the major air pollutant formed in photochemical smog and a potent greenhouse gas. Human exposure to elevated CO impairs oxygen uptake in the bloodstream. Under CO-free conditions, oxygen is transported from the lungs to tissues by hemoglobin. When CO is present, it mimics the shape of oxygen and binds instead to the hemoglobin. The molecule is not easily released, blocking further oxygen uptake, and ultimately depriving organs and tissues of life-sustaining oxygen. 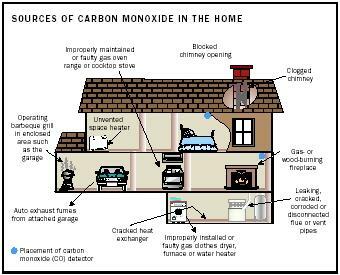 The symptoms of CO poisoning range from dizziness, mild headaches, and nausea at lower levels to severe headaches, seizures, and death at higher levels. The EPA national outdoor air quality standard for CO is nine parts per million or ppm (0.0009 percent) averaged over an eight-hour period. The gas is life-threatening after three hours at 400 ppm (0.04 percent) and within minutes at 1.28 percent. In 1996, 525 deaths in the United States were attributed to unintentional and 1,988 deaths to intentional CO poisoning. Exposure to CO can be reduced by assuring adequate ventilation when near any combustion source. Indoor cooking with charcoal and running gaspowered engines inside a garage are both dangerous and should be avoided. Fuel-burning appliances and fireplaces ought to be routinely inspected. CO detectors are available to detect less obvious sources, such as a malfunctioning furnace. The sensors operate in one of three ways: They mimic the body's response to CO (biomimetic detectors), they allow a heated metal oxide to react with the gas (metal oxide detectors), or they facilitate a reaction using platinum electrodes immersed in an electrolyte solution (electrochemical detectors). The lowest level that a CO alarm can detect is 70 ppm. SEE ALSO A IR P OLLUTION ; G LOBAL W ARMING ; G REENHOUSE G ASES ; I NDOOR A IR P OLLUTION ; O ZONE ; V EHICULAR P OLLUTION . Phillips, William G. (1998). "Carbon Monoxide Detectors, What You Need to Know." Popular Science 252(1):76–81. U.S. Environmental Protection Agency Web site. Available from http://epa.gov/IAQ .